The EF6300iSDE is the most powerful, most advanced Yamaha inverter generator ever. The EF6300iSDE cranks out up to 6300 watts of pure sine wave inverter. With sophisticated capabilities like dual 120-volt and 240- volt power, you can run almost any type of equipment with total confidence. From high-demand equipment such as well pumps, compressors and RV air conditioners to sensitive electronics like plasma TVs, satellite receivers and computers. With its electric starting capability, the automatic choke makes for easy starting. 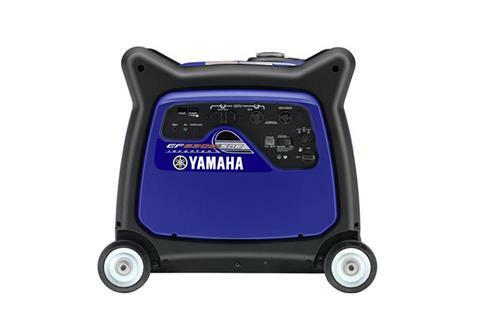 The EF6300iSDE is ideal for outdoor recreation and power outage emergencies. Excellent fuel efficiency means a run time of 13.3 hours at a constant 1/4 load on just a single tank of gas. The EF6300iSDE features Noise Block sound reduction system which makes it a very quiet generator for its output; 58-64 decibels.